The Account Name field is like a nickname you give to this account. The name you type in here is just for your own information and is a useful way to tell accounts apart if you have more than one. Account Color is also useful for multiple accounts. This color will be the text color in the list of messages for email using this account, which makes it easy to see at a glance which messages are related to which email account. Your Name is how other will see you identified on mail they receive from you. Organization is optional and can be used for a Company Name. Your Email Address and Reply-to Email Address are usually the same and are the email address that others will see your messages as having come from. Here is where you get to start using the answers you got from your email provider. If you have a popular provider, try the "?" button on the right of the Server address. If your provider is listed, you can click on it to have many of these fields filled out for your automatically. If you provider is not on the list, you'll need to fill this information out on your own. Enter the server name your email provider gave you. If they gave you a different Port, you can change it, but if they didn't say anything about the Port, then leave the default value of 110. Timeout Interval can usually be left alone, set to 60 seconds. If you know you have a particularly slow-to-respond mail provider, you can lengthen this time to 120, but this is not necessary for most users. Notice the Account Active checkbox in the lower left? Keeping this box checked means this account will be included when Intellect checks for mail, both incoming and outgoing. 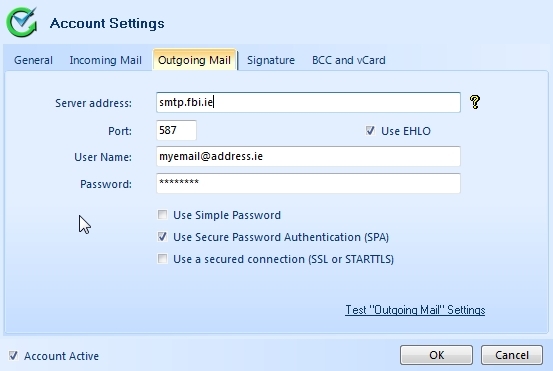 As with the incoming mail settings, if you have a popular provider, try the "?" button on the right of the Server address. If your provider is listed, you can click on it to have many of these fields filled out for your automatically. If you provider is not on the list, you'll need to fill this outgoing information out on your own. Enter the outgoing server name your email provider gave you. 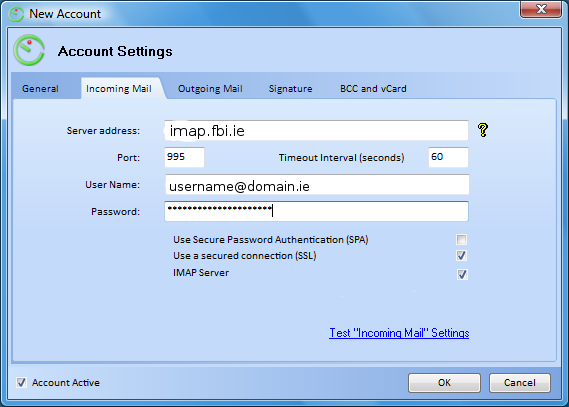 Many outgoing mail servers are slightly different from the incoming ones, so double-check you have the correct Server Name/address. Keep the box for "Use EHLO" checked! It is only in rare cases where this option is not needed! If your ISP wants you to login to "authenticate" yourself before sending messages, there are fields for User Name and Password, along with a few checkboxes for the style of authentication to be used. 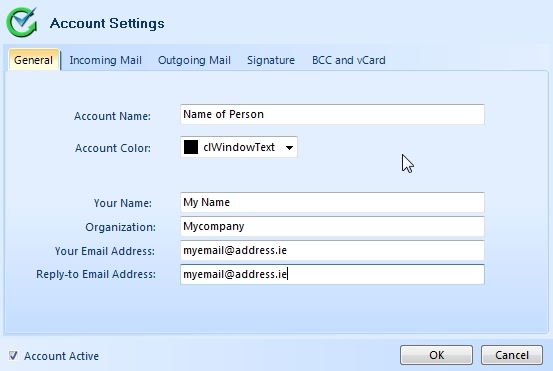 TIP: If you are switching from Outlook (or working from instructions from your ISP for Outlook Users), Outlook has an option under Outgoing Mail Server which says something like "My server requires authentication". This checkbox in Outlook would be the equivalent of the "Use Simple Password" checkbox in Intellect.